Init a raspberry pi on boot without anything ! 8 years ago, when I started working at Teevity, I discovered Amazon Web Services and a special init script for ubuntu images called "cloud init". Let's see what we can do with this and how to do the same with a raspberry pi. 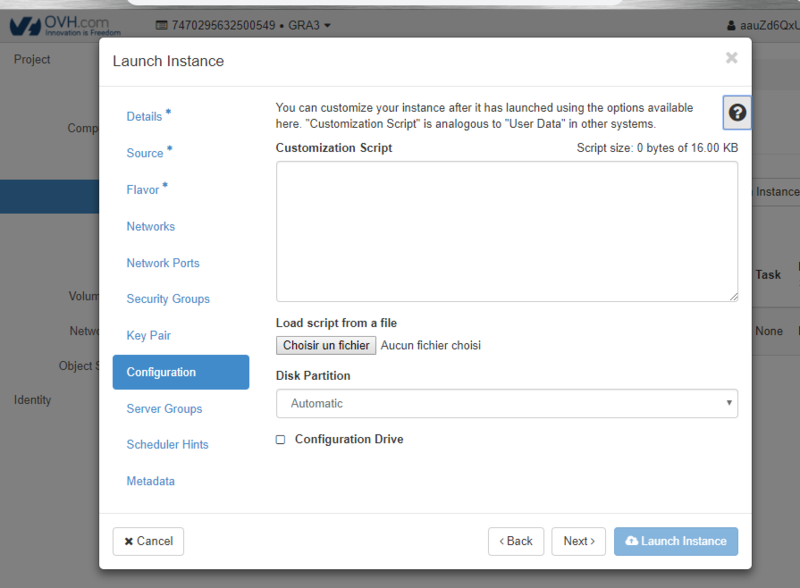 Custom scripts are attached to instances to perform specific actions when the instance is launched. For example, if you are unable to install cloud-init inside a guest operating system, you can use a custom script to get a public key and add it to the user account. Type your script directly into the Customization Script field. If your browser supports the HTML5 File API, you may choose to load your script from a file. The size of your script should not exceed 16 Kb. Cloud init is executed as the last step in the boot process. It calls the hypervisor to get metadata containing the script you typed. IE on Amazon EC2 it calls http://169.254.169.254 (check Instance Metadata and User Data documentation) In many cases it can helps a lot for automation : no custom images, a good init script can install an entire instance with all your softwares without deploying orchestration tools such as ansible or salt. Cloud init for raspberry pi ??? why ??? It is not a cloud init, but it tooks inspiration from. Build a custom image for a raspberry PI is not so easy to do. For special projects, we need to build some prototypes with special configurations, easy and fast to deploy. I mean "easy" because we do not have any connection, so no SSH, no screen and no keyboard. - a FAT32 small partition mounted as /boot. It has the main advantage to be readable on all devices. - an EXT4 containing all root file system. printf "Launching a startup script"
- install all needed dependancies (with apt and python pip), and download the last version. To make a distinction, I simply use an empty file as a flag while the installation is fresh. If the file exists, I need to install.